The Wrapper Tornado line of orbital stretch-wrapping machines, introduced by TAB Industries, LLC, Reading, PA, allows products to be fed through the company’s wrapping machinery from a chain, belt, roller or other type of conveyor. The units feature a wrapping ring that’s held stationary while the film is wrapped around a horizontal axis. They prove ideal for packaging long products such as doors, beams, bars, pipes, rods and channels, and can wrap continuously to an infinite length. 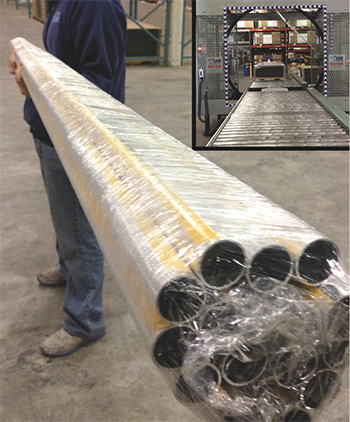 Whether loads are loose, palletized or in cartons, in uniform or various sizes, or in irregular shapes, the Wrapper Tornado machines, when positioned in or at the end of a conveyor line, eliminate the need to transfer products from a conveyor for staging or stretch-wrapping, while reducing the risk of product damage due to handling and saving time and labor. They wrap plastic stretch film 360 deg. around and under an entire load in 1 min. or less—including the pallet, if desired—to create a single, unitized, secure load safe from the elements.